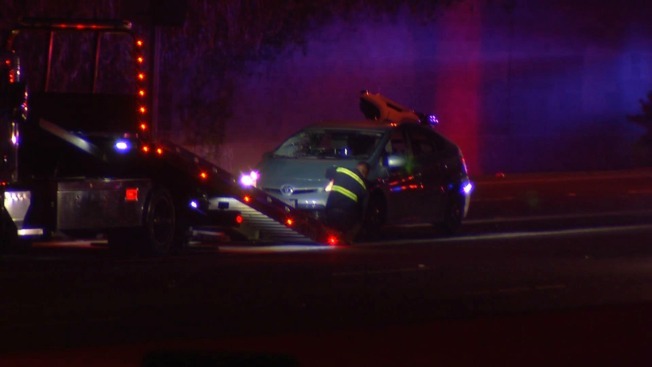 A male driver being chased by authorities late Monday in Sunnyvale was struck by a car after he hopped out of his sedan, jumped the center-divider and ran into oncoming traffic, according to the Santa Clara County Sheriff's Department. Officers administered first aid, but the driver, who has yet to be identified, was later pronounced dead at Santa Clara Valley Medical Center, the sheriff's office said. The pursuit originally began around 9:50 p.m. when sheriff's deputies spotted a suspicious vehicle at a gas station in San Jose, according to the sheriff's office. Officers approached the vehicle before the driver suddenly backed up, hit a cruiser and fled the scene. A roughly 16-minute chase ensued, according to the sheriff's office. The driver, who managed to damage and flatten two of his tires during the pursuit, tried to hit a patrol car on multiple occasions. Deputies did not reciprocate. Just before CHP officers arrived to assist, the driver stopped his car next to the center divider near the Fair Oaks Avenue exit, according to the sheriff's office. He hopped the wall and ran across southbound lanes of traffic before being hit by a Toyota Prius driving in a slow lane. The driver was pronounced dead at the hospital around 10:45 p.m., according to the sheriff's department. No one else was injured during the chase and collision. An investigation is ongoing at this time. Authorities will not release the driver's name until his next of kin are notified.